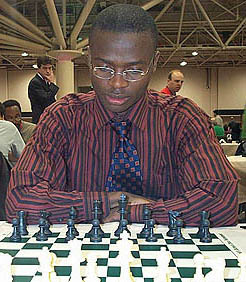 Zambian International Master Amon Simutowe has set forth on an ambitious plan in which he will play in several tournaments in 2007. The plan comes after his successful completion of his Bachelor's degree in finance and economics at University of Texas--Dallas. There he had an illustrious career and graduated with Honors (3.73/4.00 grade point average) and played on two collegiate championship teams. Perhaps Simutowe is best known as the 18-year who took the world by storm by scoring well in prestigious international tournaments, nearly winning the World Junior Championship, vaulting to 2462 ELO and competing in the World Championship qualifier. For the past four years, he has played collegiate chess and several open tournaments on the U.S. circuit. Simutowe has recently announced that he has decided to make a run for the last norm before returning to school to pursue graduate studies in finance and economics. He has recently run into a bit of controversy. In the Zambian Post and Daily Mail, he excoriates the Zambian Chess Federation (CFZ) by stating that they have not provided support to develop chess in the country. Only three weeks ago, current African Junior champion and now International Master Chitumbo Mwali had made similar criticisms in the Zambian Post. What I find troubling is that the Colonel was involved in a corruption scandal and the chess community does not know whether he has been cleared… I think that's affecting sponsorship and the image of the game. I challenge the Colonel to publicly declare he has been cleared of corruption charges. This is not mudslinging but sincere concern of a player Colonel Kausu represents." Controversy has continued to wreak havoc in the Kausu administration as last year he was involved in the controversy surrounding British Grandmaster Nigel Short's visit to Zambia. Kausu defused that case with a well-crafted letter and testimony by Simutowe and former CFZ President Lewis Ncube. However this case has descended into a bitter exchange of words and threats. Simutowe was unrelenting stating that the CFZ has been "drinking coffee in office for one year." "My aim at this point is to highlight the displeasure, but also to let people know that (under the circumstances) I will pursue the quest." In the meantime, he will concentrate on chess in the next several months in hopes that his can earn the 3rd and final GM norm. His feat would indeed bring glory to Zambia, the African continent and provide a positive example for Black chess players around the world. It is far more than an individual accomplishment. Simutowe's GM title would certainly represent a breakthrough for African chess and provide more marketing opportunities for sponsorship in Zambia as well as the African continent. He could be "Africa's Next Hope."